The Exchangeable image file format (Exif) is a standard that’s been around since 1998 to include metadata in image file formats like JPEG, WAV, HEIC, and WEBP. With the proliferation of digital cameras and smart phones with GPS receivers these images often include geolocation coordinates. We’re going to get started with how to read geotagged photographs using Python to make use of the data. 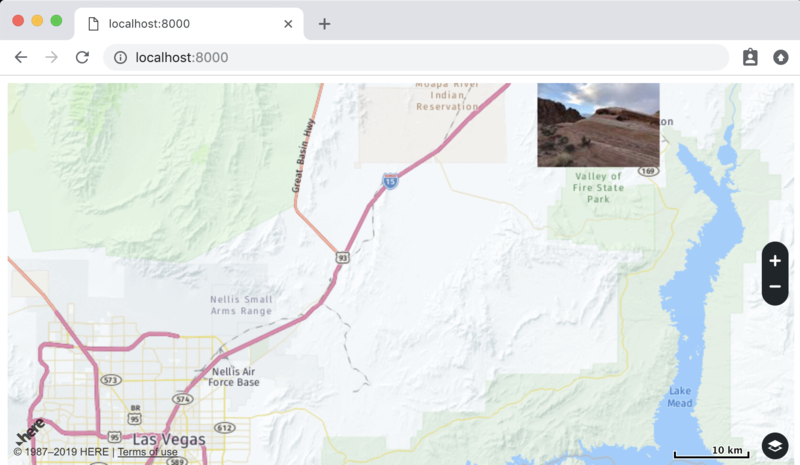 This project will demonstrate how to extract Exif data from a JPEG, how to convert from Degrees Minutes Seconds (DMS) to decimal coordinates, how to group photos by location, and finally how to place a thumbnail image on a map like this. I’ll be working with Python 3.7 in the examples since it’s almost 2020 and Python 2.7 won't be supported for much longer. I use virtualenv and virtualenv_wrapper to keep my project dependencies straight and recommend you do as well if you run into any issues installing libraries. There are several options you can use for reading Exif data such as piexif and exifread that you might like to try. As a more general purpose image library, I find Pillow to be helpful and is an update for some of the code samples you may see from Python 2.x examples referencing PIL. What you get back from this get_exif() function is a dictionary with numeric keys that correspond to various types of data. It isn’t terribly useful unless you know what you are looking for. Fortunately, the library also makes it easy to identify these attributes with human readable labels. The label GPSInfo is much more meaningful than 34853 which is the numeric code defined in the standard for identifying the GPS data in Exif. The tags also show a variety of other details like the camera used, image dimensions, settings, etc. beyond just the geotagging results. To get a full list of the tags the Exiv2 Metadata reference table is pretty handy. If you are trying to make sense of the GPSLatitude and GPSLongitude values you’ll notice they are stored in degrees, minutes, and seconds format. It’ll be easier to use HERE Services available with your developer account when working in decimal units so we should do that conversion. At this point, given an image as the input I’ve produced a latitude and longitude (36.13372, -115.15228) result. To figure out where that is we can use the geocoding service. In Turn Text Into HERE Maps with Python NLTK, I demonstrated how to use the Geocoder API to take a city like “Gryfino” and search to identify the latitude and longitude coordinates. Now, I want to do the opposite and reverse geocode the set of coordinates from my image to identify the location. If you’ve worked with HERE services before you should know all about your APP ID and APP CODE from the developer projects dashboard. Personally, I like to store these values in a shell script to config my environment as demonstrated in this next snippet. This is pretty much boilerplate use of the Python requests library to work with web services that you can get with a pip install requests. I’m then calling the Reverse Geocoder API endpoint with parameters to retrieve the closest address within 50 meters. This returns a JSON response that I can use to quickly label the photograph with Las Vegas, NV 89109, United States to create an album or whichever level of detail I find useful for an application. This is a good way for example to process and group your photos by city, state, country or zip code with just a little bit of batch sorting. An alternative approach that can simplify the code a bit is to use the geopy library that you can get with a pip install geopy. It depends on the level of detail and flexibility you want from a full REST request but for simple use cases can greatly reduce the complexity of your code. 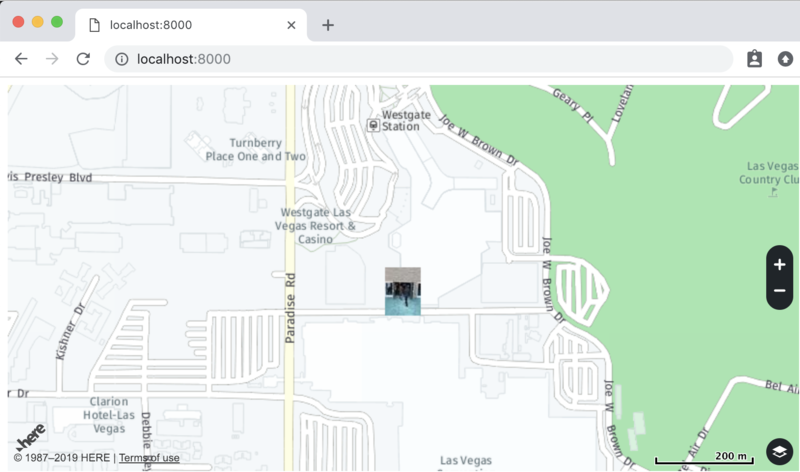 The response using geopy in this example is: Location(1457 Silver Mesa Way, Las Vegas, NV 89169, United States, Las Vegas, NV 89169, USA, (36.13146, -115.1328, 0.0)). This can be convenient but customizing your request to the REST endpoint gives you the most flexibility. What if you don’t want geotagging details in photos that you share or put on a public website? While using the above is handy when working with my own photographs – if trying to sell something on Facebook Marketplace, Craigslist, or eBay I might want to avoid giving away my home address. It’s pretty straightforward to remove the geotagging details by creating a new image and not copying the Exif metadata. I already have the coordinates for my image so all that is left is to generate a small thumbnail that I can use for the marker. 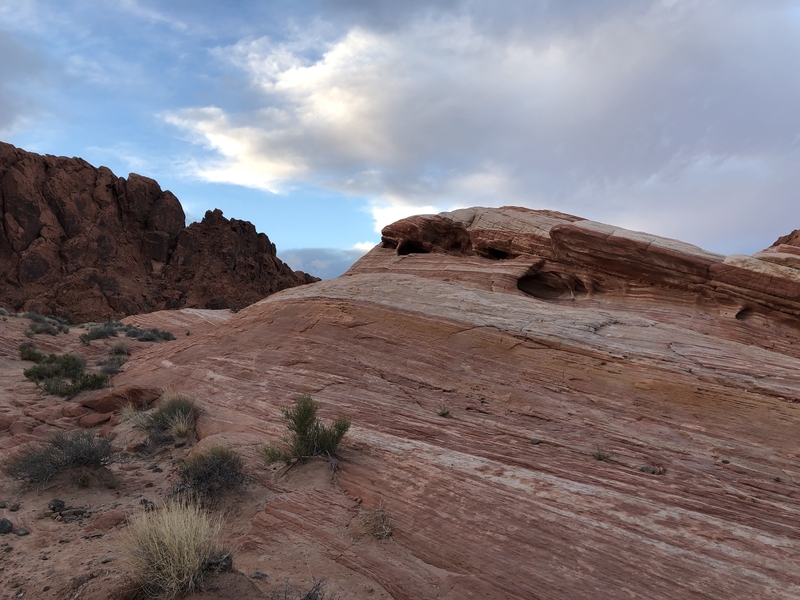 That photo was of the doorway in between the Las Vegas Convention Center and Westgate, not nearly as exciting as the Valley of Fire State Park pictured initially. Wrapping up, a few final notes that might be helpful. There is Exif support in image formats like WEBP commonly used by Chrome and HEIC (or HEIF) which is the new default on iOS. Some of the supporting Python libraries are still being updated to work with these newer image formats though so require some additional work. There is also the c++ library exiv2 that is made available in the Python3 package py3exiv2 for reading and writing Exif data but it proved challenging to install with boost-python3 on OSX recently. If you’ve had any luck with these other image formats or libraries, please do share in the comments. The example project here should demonstrate all the steps you need for an image processing pipeline that can extract geotagged details from photographs and organize by location or place the photo on a map much like you see in apps on a phone. Sign up for a developer account to make use of the Map Image and Geocoding APIs on your next project. Read more posts from Jayson DeLancey. Jayson is a Senior Developer Evangelist with HERE Technologies in Berkeley, CA. He writes about his location technology experiences related to Web, IoT, and Robotics projects using a variety of technologies like ReactJS, Python, and Cloud Foundry. Jayson is an active advocate for maker and open-source communities. You can also find him on Twitter (@jaysondelancey) or LinkedIn (in/jaysondelancey).